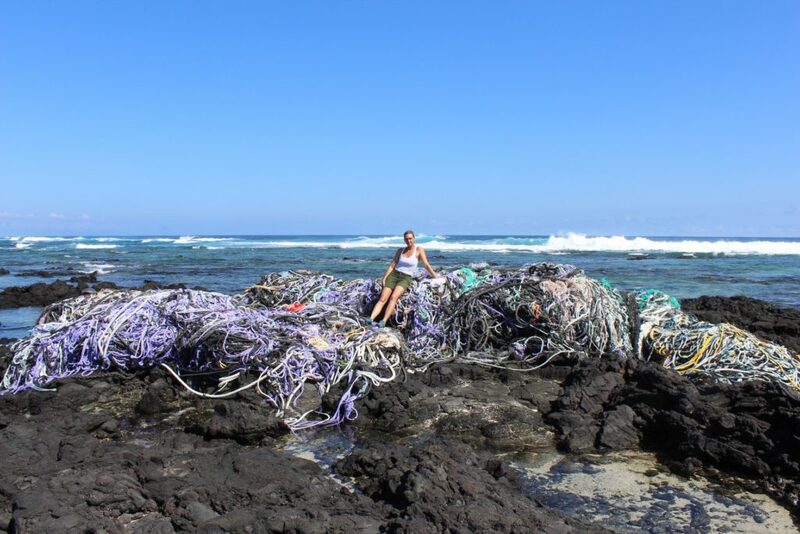 A week ago, University of Hawai‘i researcher Sarah-Jeanne Royer was photographed standing on an enormous tangle of derelict fishing rope embedded on the lava rock coastline of Kamilo Point on Hawai‘i island’s far southeast side. 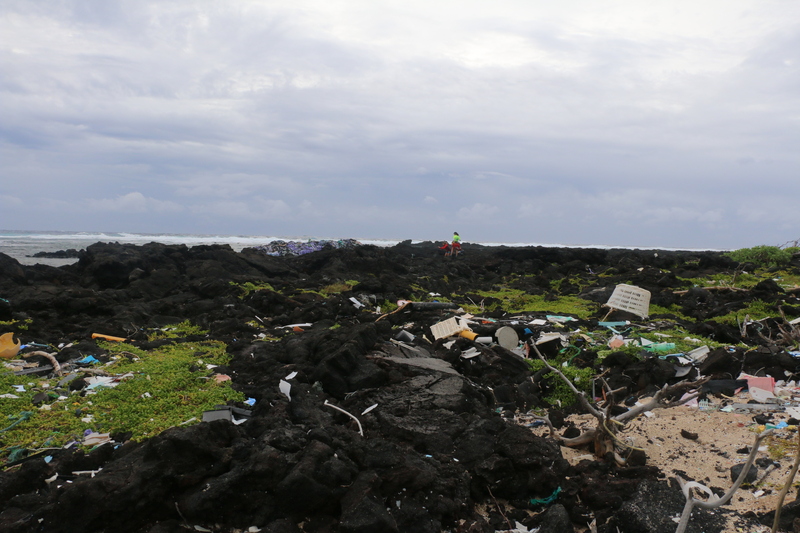 Yesterday, Feb. 22, 2018, Royer and volunteers from the Hawai‘i Wildlife Fund were back at Kamilo; nicknamed “Plastic Beach” for its long history of being ground zero for ocean-born marine debris. 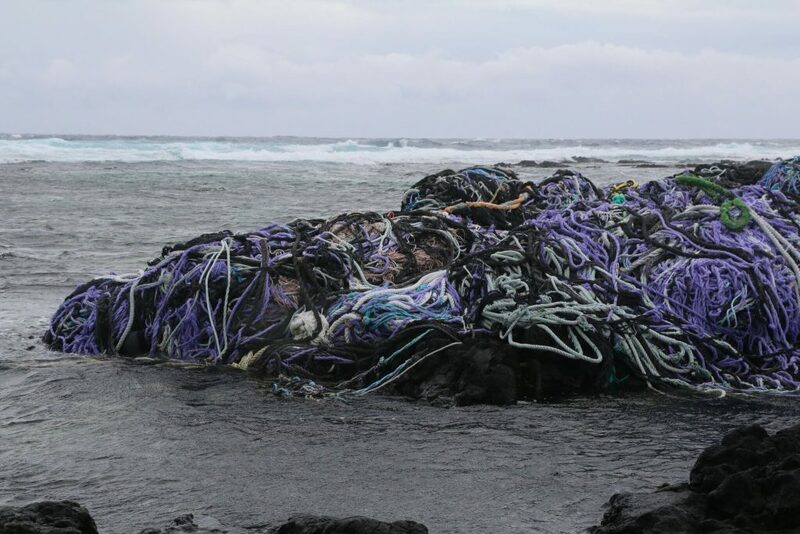 The rope mass washed ashore in late January and when Royer, with the International Pacific Research Center (IPRC) at UH’s School of Ocean and Earth Science and Technology (SOEST), first viewed it, she figured it weighed about 40 tons. 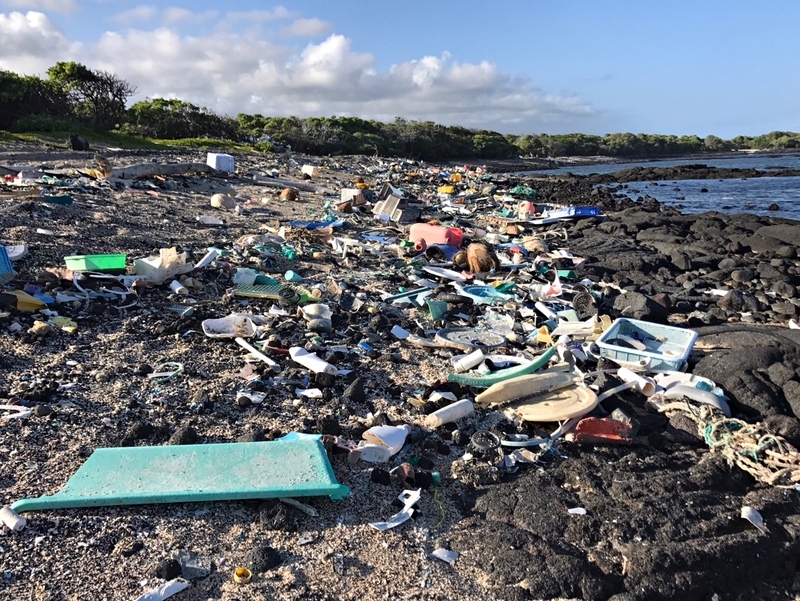 The Kamilo Point mass is demonstrative of the unprecedented arrival of large collections of marine debris to Hawai‘i this year. Over the past month, the state Department of Land and Natural Resources has removed or funded the removal of eight derelict fishing net/rope masses from nearshore waters and various shorelines. Clifford Inn of the DLNR Division of Boating and Ocean Recreation is responsible for coordinating the agency’s marine debris response activities. 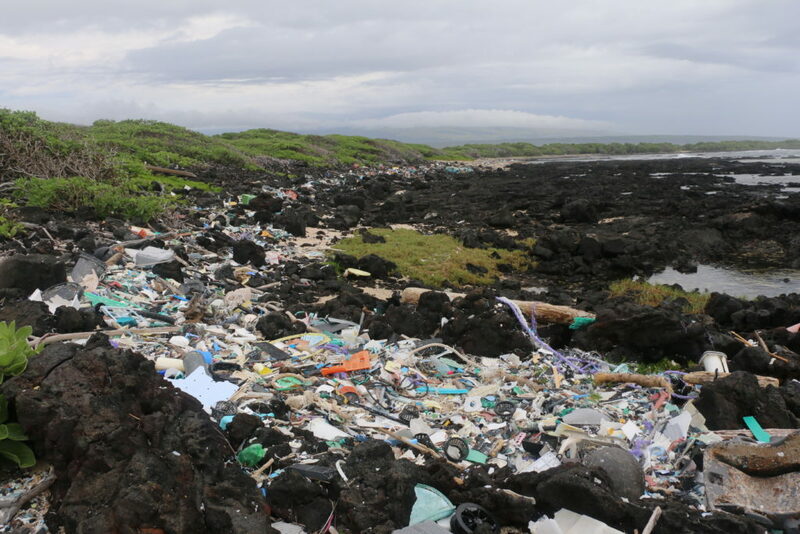 “I’ve been involved in monitoring and managing marine debris across the main Hawaiian Islands for at least a decade and during that time I’ve never seen such a large accumulation of net masses,” said Inn. 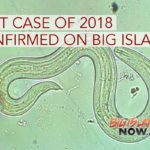 DLNR works closely with other government agencies and volunteer beach cleanup groups to try and keep up with reporting and clean-up of marine debris. 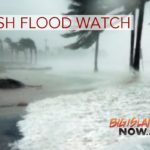 “We encourage people to report marine debris to our hotlines and websites (listed below), but we want people to understand that unless it is an emergency situation, in which there is a threat to public safety or hazards to mariners, it may take some time to remove the debris,” Inn said. Royer is part of Nikolai Maximenko’s group at IPRC and one of their scientific objectives is to track the movement of marine debris. This is very challenging. In a vast ocean full of debris, it is extremely difficult to track. 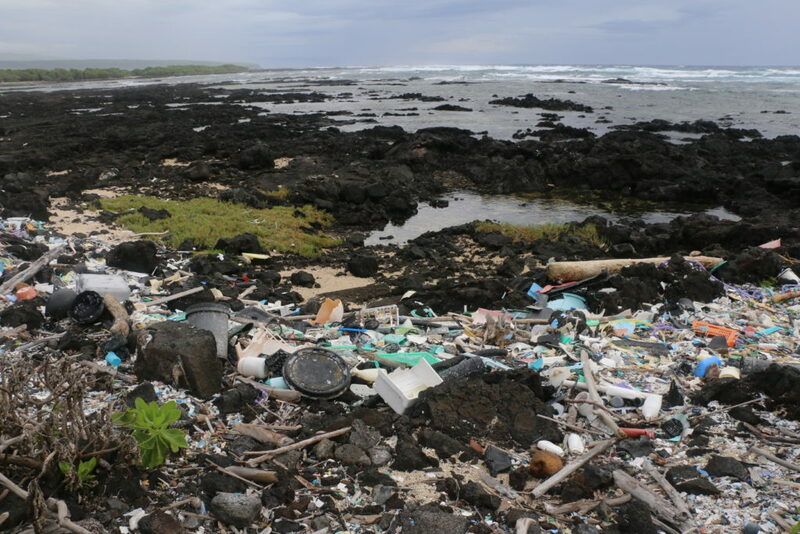 For example, earlier this year a fisherman reported a two-mile-long debris field in the Ka Iwi Channel. It was last spotted about 9.5 nautical miles south of Koko Head. From there it either drifted further from the islands or broke apart. 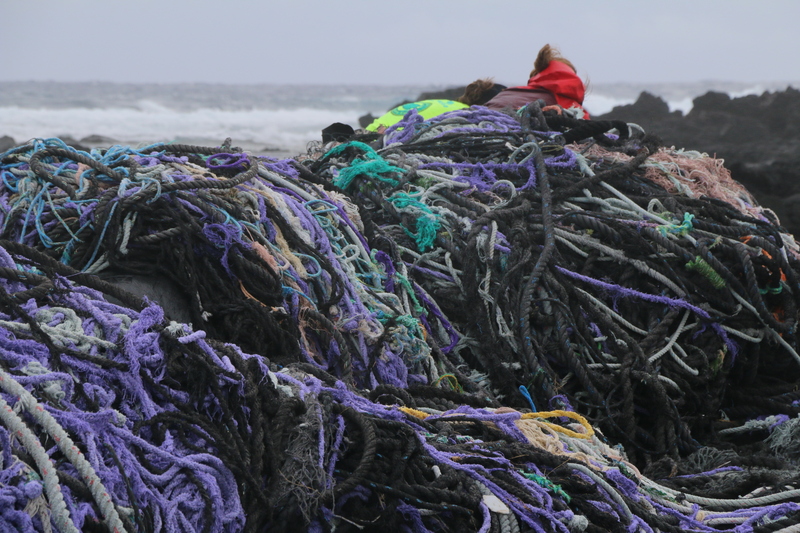 It’s possible some of the nets now washing ashore were part of the Ka Iwi debris field. Without putting GPS trackers on them, predicting their movement is difficult, if not impossible. Maximenko’s group recently started a project where they attach GPS trackers on marine debris in the ocean to better predict their pathways and trajectories. This project using short-life GPS trackers is part of a bigger project with NASA where GPS buoys will be deployed on marine debris for more than a year. 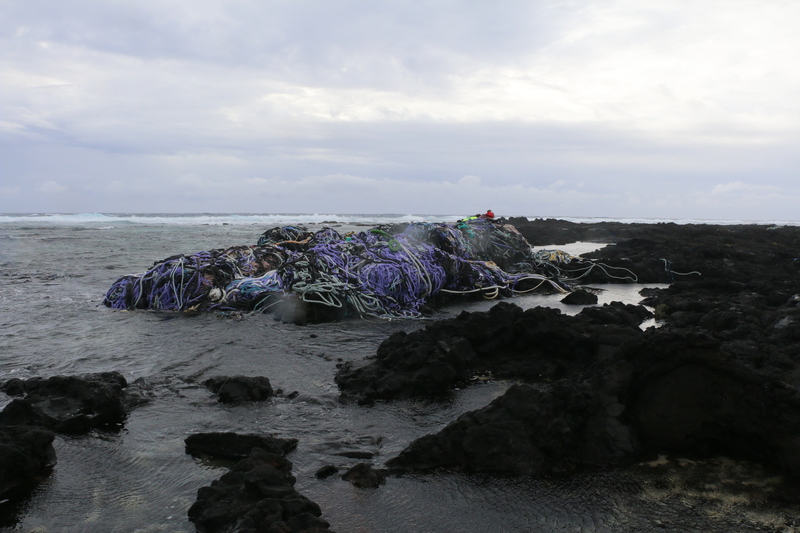 To help with their study, Royer also wants mariners and others who spot drifting nets and marine debris in the ocean and onshore to report them to the IPRC (marinedebris@soest.hawaii.edu). Based on debris that’s had identifying marks or lettering, it’s believed much of it originates in Asia. Some debris from the Japan tsunami of 2011 continues to show up in Hawai‘i, but over time that amount seems to be declining. Back at Kamilo Point, Bill Gilmartin of the Hawai‘i Wildlife Fund and another volunteer collected ropes and nets that had already washed onto the beach. The nonprofit organization has been removing debris here for the past 15 years and estimate they’ve removed and transported more than 231 tons of debris. 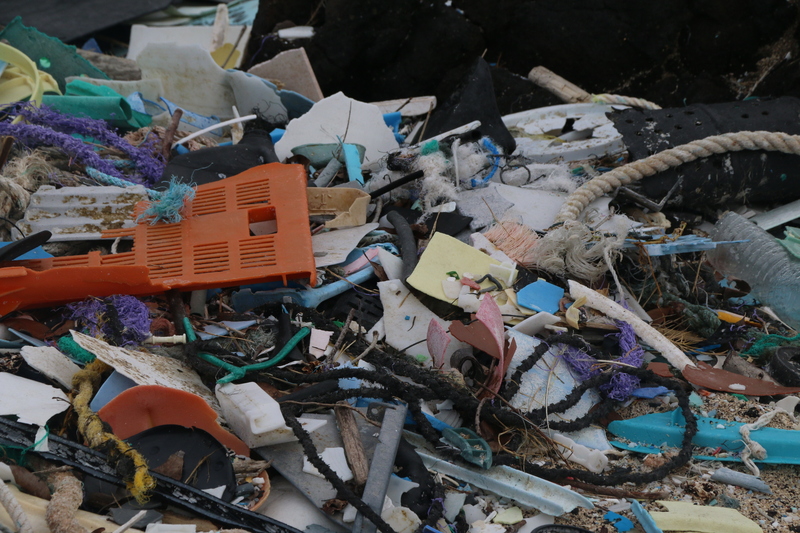 There’s such an incredible amount of junk in the ocean, it’s hard to think it will ever be completely cleaned up. But we can all do our part now, not to add to the problem, he added. DLNR is investigating how to remove the rope mass at Kamilo Point. Based on Royer’s and Gilmartin’s assessments, given the weight of the water-logged jumble, it will be extremely difficult to pull it off the ragged lava coastline and the help of many will be necessary to complete this mission.